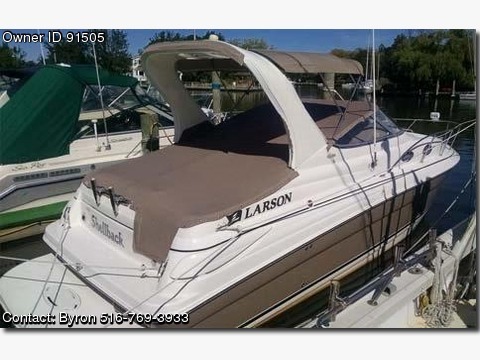 Boat owners notes for 2006 Larson Cabrio 260 in Excellent condition, Call owner Byron @ 516-769-3933. Overview: I am the original owner of this Cabrio 260 which was one of Larson’s best selling design for years for good reasons. Features: Her hull design not only boasts under 8 gph at 3400 rpm while doing 23 mph, it is a very comfortable and dry ride in rough water, With the dockside air conditioning and heat she sleeps four comfortably, As common for a cruiser she has a head with shower, galley with range, microwave and refrigerator with freezer, Her unique cabin area does not have a “V” berth, instead the bunk is in a set position with a pull up back-rest to make for seating for four at the table,This eliminates pesty filler cushions each time you make the berth, We love it. Additional Notes: The boat was fitted with all new custom made canvas and mooring cover this year, I kept the old mooring cover for off season use before shrink wrap. Description: The boat weighs in at around 6500 lbs, holds 80 gallons of regular gas and with the Volvo 5.7 gxi with 320 hp and duo prop, she gets up on plane in a hurry and handles well around the dock, Each spring the mechanic and I sea trial after the annual tune up and get 40 mph at 5000 rpm, Manifolds and risers are two years old as well as sea water pump and thermostat, The air conditioning,hot water heater and many other items have also been replaced,This is a good clean boat at more than a fair price.